Sammak's work on the double happiness blog is diverse but the allover abstractions have some kinship to Millree Hughes' work. While everyone yodeled the flattering claims [in the days immediately following Russert's death], a few people poked at the truth. It’s for the good of us all and Tim never forgot the purpose of truth in getting at it was the good of us all. We needed the truth. And boy, did I look up to him. Somerby also quotes a Bill Moyers interview where Russert says he wishes someone had called him with information suggesting the nuclear claims were bogus. In response to this embarrassing admission of journalistic incompetence, Moyers noted that CBS’s Bob Simon had "just picked up the phone" and was able to air a report questioning the claims. 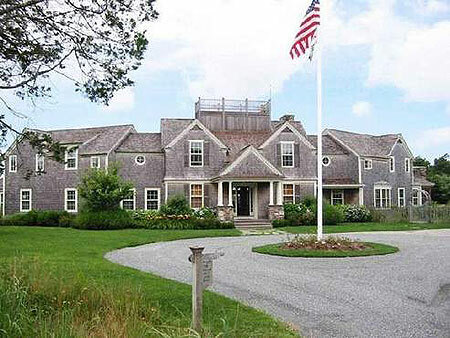 The late Tim Russert's summer home in Nantucket, from the Cape Cod Times via Bob Somerby. .... In his own trial testimony, Russert explained his own unique approach to the concept of "off the record" conversations with public officials. Russert said public officials do not have to ask to go off the record with him. They are always presumptively off the record. Then, if he wants to get them on the record, he revisits the point and asks them to go public. But Russert's policy is one of his own invention, and it's the kind of policy you'd have if you prized your cozy relationship with powerful people more highly than you prized your role as a reporter. I mention all this because, here and there, you read comments about the prosecutor Patrick Fitzgerald and how much he damaged the First Amendment by sweating a bunch of journalists. Please. It's more like he lanced some kind of infectious boil. And I mention it because now you don't have to watch "Meet the Press." Just a quibble, ANWR is a convenient abbreviation for a journalist but it's also a term that right-wing consultant Frank Luntz used with numbing, Goebbels-like repetitiveness in his infamous strategy report for Republicans (the one where he recommended using "death tax" for estate tax and "energy exploration" for oil drilling). He claims (crows) that "an incredible 87% of Americans" don't know what the initials stand for. Whether or not that's true, "drilling for oil in the Arctic National Wildlife Refuge" sounds worse than "drilling for oil in ANWR." Using the full term reminds us of the undespoiled environment that powerful interests want to ruin (oil spills without punishment, anyone?) so that Americans can spend a few more hours in their cars.